If you are looking for something new to add to your bread box - these little beauties are perfect! 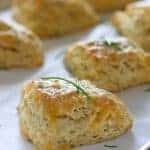 As easy as biscuits to make but twice as tasty! In a large bowl, whisk together the flour, sugar, baking powder and salt. Cut the butter into the flour with a pastry cutter or food processor. Whisk 2 eggs and combine with the buttermilk. Add to the flour mixture and stir until just moist. Stir in the cheddar and chives and mix lightly. The dough will be sticky. Turn the sticky dough out onto a well floured board and knead lightly. Cut dough in half. Roll each half into a circle...about 3/4 inch thick. Cut each circle into 4 wedges. Whisk remaining egg in a small dish and brush on top of the scones.